CREEPYTOWN tells the story of Lucy, a young vegetarian vampire princess who longs to be different and escape the dreams of her controlling parents. Meeting an adventurous human girl named Jane, whose family open a dental clinic in the town, Lucy makes plans to escape Creepytown forever. Jane and Lucy sing of their plans to take control of their futures in the emotional duet,“My Life”. But when their plan is discovered by the evil Hunchback and his henchmen – “I gotta hunch” – Jane and Lucy are thrown into a spiral of chaos that sees their lives forever changed. 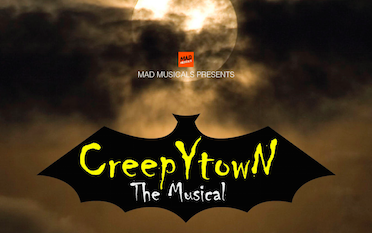 With an 11-track original musical soundtrack, a giant set illuminated with professional lighting and audiovisuals and professional make-up for all performers, CREEPYTOWN is an epic production on a grand scale. This 90 minute 2 act show is highly engaging for the performers and audiences alike!